By Catherine Downes and Tara Nieuwesteeg | 3 months ago These aren’t merely places to get a drink. No, these are where stories begin, where adventures unfold, where plot twists occur, and new characters join in. Where life happens. By Kathy Wise | 3 months ago Although our love is unrequited, we can't quit our favorite Rocky Mountain state. We talked with six Dallasites to find out why they keep returning for that perfect powder. By Harriet P. Gross | 3 months ago A new Dallas museum will show an exhibit with a Holocaust survivor the likes of which you’ve never seen. Or talked to. 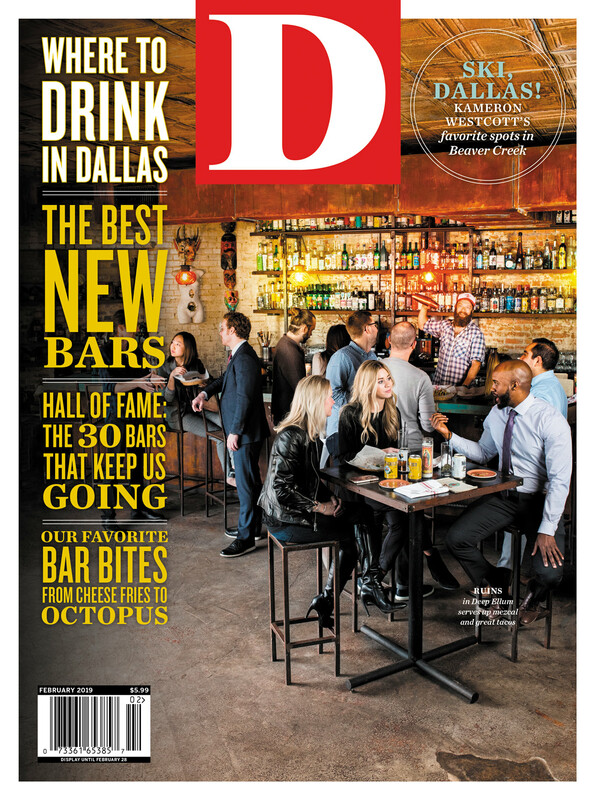 By Catherine Downes | 3 months ago You can find nearly anything in a Dallas bar. That means cheese fries, yes, but also pho and octopus and bison chili. By S. Holland Murphy | 3 months ago The most memorable part of a Petal Pushers bouquet: the delivery method. By Eve Hill-Agnus | 3 months ago Sarah Zubiate makes queso and crema fit for vegans, but tasty for all. By Matt Goodman | 3 months ago Making peace with the absurdity of indoor cycling was the only way to keep me off my couch. By Tim Rogers | 3 months ago A dispatch from the land of No Scene Control. By Eve Hill-Agnus | 3 months ago Shebelle Ethiopian Cuisine & Bar brings the flavors of berbere to North Dallas. A version of them, anyway. By Christiana Nielson | 3 months ago Our local corps celebrates a stellar report card with a party. By Matt Goodman | 3 months ago The Councilman has a weird thing for bobbleheads.